Protesters near Southside Sundry and Southside Business Machines, Main Street, Farmville, Va., July 1963. Irene Williams carries "Don't Buy Segregation." Kenneth Johnson stands at left in dark pants. Protesters carry signs opposing racial segregation, and encouraging shoppers to boycott businesses that support discriminatory practices. Program of Action: The Rev. L. Francis Griffin and the Struggle for Racial Equality in Farmville, 1963, VCU Libraries Scholars Compass. 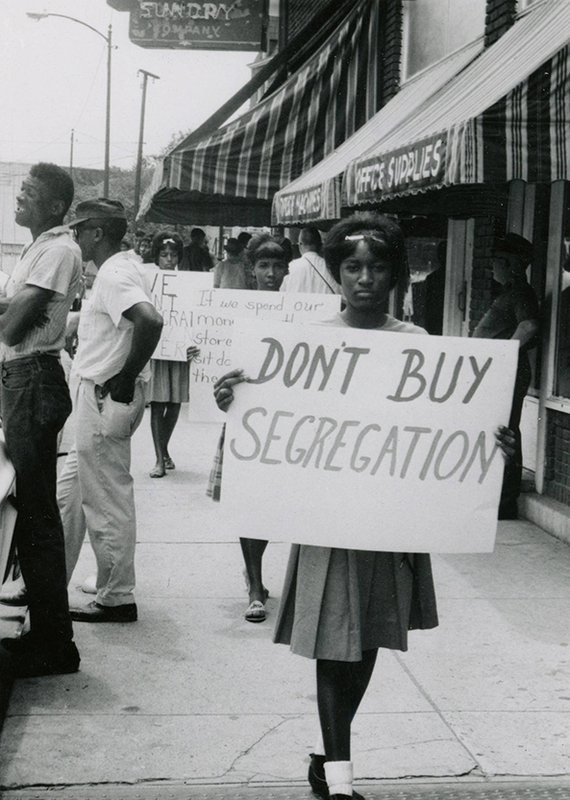 “Don't Buy Segregation [1963 Farmville, Va. protests],” Social Welfare History Image Portal, accessed April 26, 2019, https://images.socialwelfare.library.vcu.edu/items/show/161.